A short audio clip is completely puzzling the world and pitting friend against friend in the online debate. What is the voice saying – is it Yanny or is it Laurel? Some people think they hear the word "Laurel" while others are convinced it says "Yanny." It's the most perplexing phenomenon since the great the dress debate of 2015. "Yanny or Laurel" took the internet by storm after a Reddit user posted the short clip of a word being read out loud, asking fellow Reddit users a simple question: What do you hear? The clip was posted a few days ago, and now hundreds of thousands of people are engaged in a debate over what they hear. When the "Laurel v. Yanny" debate erupted, even celebrities like like Ellen DeGeneres and JJ Watt were talking about it (DeGeneres thought it was "Laurel" but Watt was Team "Yanny"). Wired magazine solved part of the mystery Wednesday when it revealed the origins of the audio recording in question. Katie Hetzel, a freshman at Flowery Branch High School in Georgia, had a question about one of her vocabulary words, "laurel." "She looked it up on Vocabulary.com, and played the audio. Instead of the word in front of her, she heard 'yanny.'" Wired reports. "I asked my friends in my class and we all heard mixed things," Hetzel told Wired. She posted the audio clip to her Instagram story, another student re-published it as a poll, and then a friend put it on Reddit, thus sparking the nationwide debate. But even if that explains which word was originally spoken, what accounts for the fact that some listeners hear something completely different? As people took to social media to let the world know what they heard -- and argue with those who hear differently -- scientists were trying to figure out why this debate even exists. 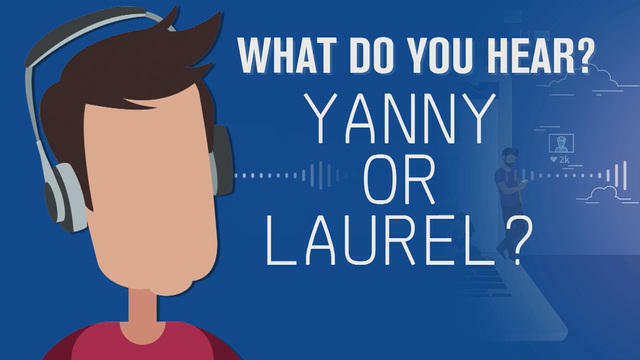 How can some people hear "Yanny" and others the completely different-sounding "Laurel"? Several researchers agreed that the audio recording is just too ambiguous. Theoretically, listeners can hear different sounds depending on whether the low frequencies or high frequencies are amplified, CNET reports. One Twitter user proved this by adjusting the bass levels of the original recording. As the bass is adjusted, the word seems to shift. However, this doesn't explain why someone would hear the lower frequencies and some hear the higher frequencies in the first place. What could alter what you hear are your headphones or audio equipment. Mediocre speakers don't usually play both quality bass and treble. So if you're listening on your phone, laptop speakers or through cheap headphones, you might hear something different than with a high-quality sound system, CNET reports. But what if two people are both listening through the same speaker and hear different things? Well, your ears just might be different. "If I cut your ears off and put someone else's on your head, sounds would sound different," Howard Nusbaum, a psychologist who studies speech science at the University of Chicago, told Gizmodo. He explained that differently shaped ears focus sounds differently. You might actually hear sounds differently than the person next to you. Even with various explanations as to why we are all hearing this recording differently, people are still joining in the debate. "CBS This Morning" co-hosts Norah O'Donell and John Dickerson heard "Laurel" while Gayle King heard "Yanny." "I don't know why I'm so personally offended by this," King said during their rousing debate over the recording. "It's definitely, definitely, definitely 'Yanny.'"